My son and I went a little overboard planting radishes this spring. Since they are quick to grow, I knew seeing all the little green sprouts within a few days would keep him excited about our little backyard garden beds. Now I’m stuck with a glut of radishes. 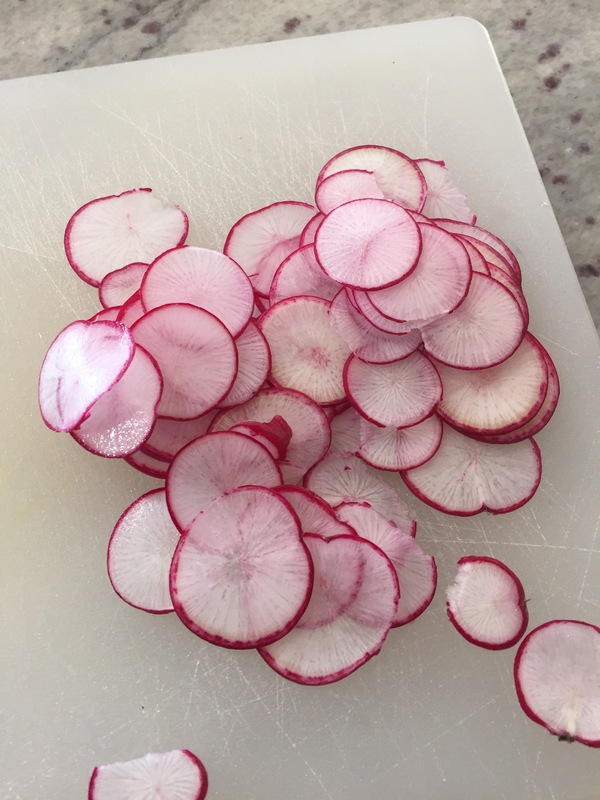 I like radishes…but how many can one person eat? 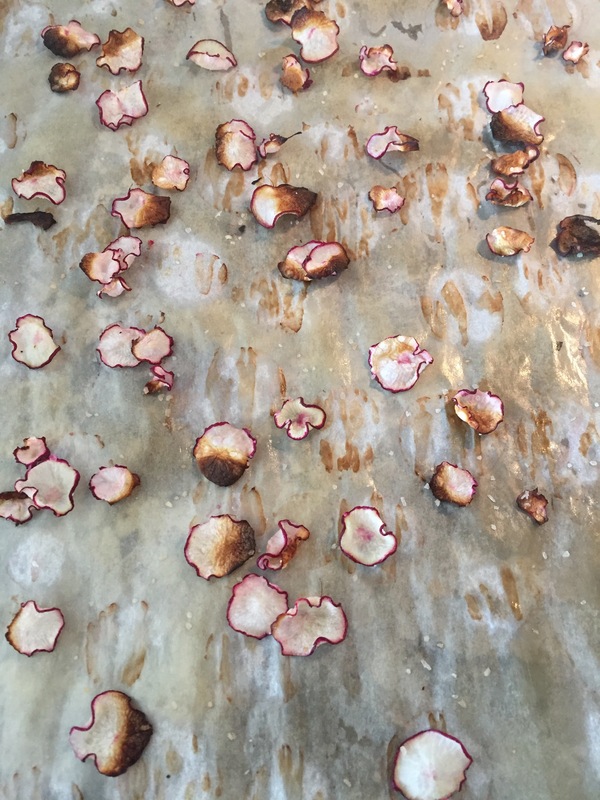 I turned to google and came across a few recipes for radish chips. 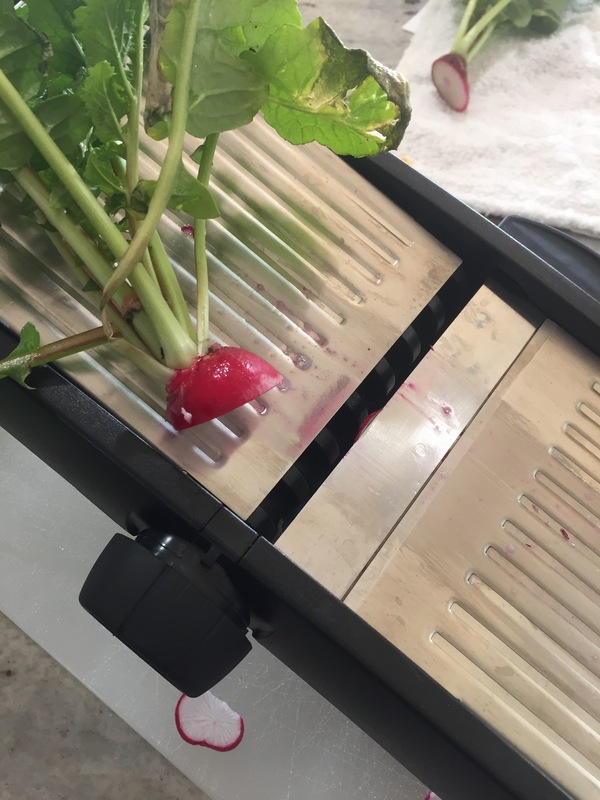 They were all pretty vague, so I sacrificed just two radishes for the first try. I sliced them on the thinnest setting on my mandolin. I don’t use my mandolin often but it’s the only tool for some jobs. Then, spread them on a single layer and spray with olive oil. Since I’m lazy, I used the olive oil Pam spray. One of these days I’ll get a real olive oil sprayer… Then, sprinkle with salt. Then I baked at 400 degrees. They baked quickly and some of them got a little brown before I realized it. I mixed them up and put them on a lower rack in the oven to finish crisping up. These were delicious but need some work. The line between soggy and burnt is very thin but I have some ideas to help. Slice them a little thicker to give them a little bit more cooking time. Dry the slices before applying the olive oil. A lower oven temp (350?) and the rack in the low/middle of the oven. As for taste, these were surprisingly delicious. Crispy like a potato chip with just a little bit of the radish flavor remaining. If you like kale chips but wish they were a little more substantial like a potato chips, these will be right up your alley. I’ll be trying these again soon. Maybe even today since some of the radishes are really starting to crowd my pepper plant! 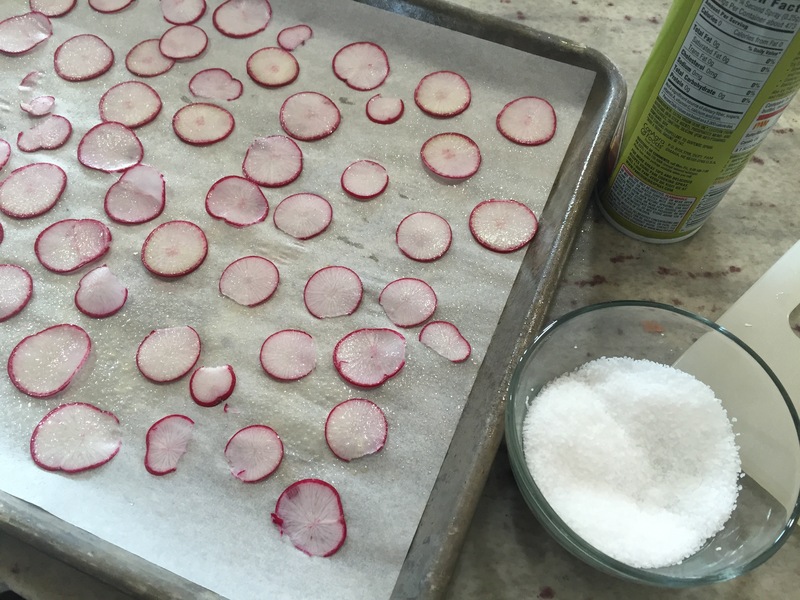 I love radishes -I’m going to try this, I’d never heard of radish chips before!! I hope you like them! I’d love to hear how yours turn out! YESSSS. You know how I feel about radishes. Which is to say, RADISH ALL THE THINGS. Yum, yum, yum.